The Namib Desert is a coastal desert in Namibia and southwestern Angola that encompasses the world's highest sand dunes, gravel plains, and rugged mountains. 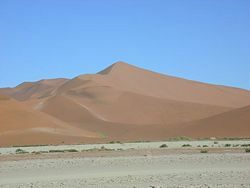 It stretches some 1,200 miles (1,900 km) along the Atlantic coast of Namibia, which is named after this desert. The name "Namib" is from a word in the Nama language that means "immense." The desert occupies an area of around 31,200 m² (80,000 km²), though its east–west width varies from 30 to 100 miles (50–160 km). The area is considered to be the oldest desert in the world, having endured arid or semi-arid conditions for an estimated 55 to 80 million years. The Namib is an important location for the mining of diamonds, tungsten, and salt. The diamonds, which are alluvial, are found in beds of gravel. The desert's aridity is caused by the descent of dry, warm air from the east that is cooled by the cold Benguela current along the coast. The upper layer of warm, dry air prevents the cool, humid air from rising and forming clouds. Some areas have less than half an inch (10 mm) of rain annually and are almost completely barren. The Namib Desert is believed to be the world’s oldest desert and it has been arid for at least 55 million years. The convergence of the Benguela upwelling and the hot interior have maintained, and perhaps increased, this aridity in recent times, but they did not generate the aridity. The region, isolated between the ocean and the escarpment, is considered to be a constant island of aridity surrounded by a sea of climatic change. The arid conditions probably started with the continental split of West Gondwana 130 million to 145 million years ago when this area shifted to its present position along the Tropic of Capricorn. This lengthy dry period has had a profound influence on the region’s biodiversity. The region has remained a relatively stable center for the evolution of desert species. This has resulted in a unique array of biodiversity with high levels of endemism and numerous advanced adaptations to arid conditions. 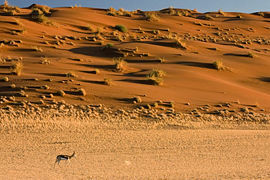 The Namib Desert is home to a number of unusual species of plants and animals that are found nowhere else in the world. One of these is Welwitschia mirabilis, a shrub-like plant that grows just two long leaves continuously throughout its lifetime. These leaves may grow to be several meters long and over time become gnarled and twisted from the desert winds. They are the longest-lived leaves of any member of the plant kingdom. It is estimated that the largest of these plants are about 2,500 years old. 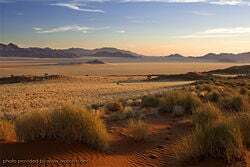 There are almost 70 reptile species in the ecoregion, of which five are found only in the Namib Desert. The desert is also home to a large number of small rodent species that occur among the rocky habitats in the western deserts, in the sand dunes, and in the vegetation of the gravel plains. The interaction between the water-laden air coming from the sea via southerly winds, some of the strongest of any coastal desert, and the dry air of the desert causes immense fogs and strong currents in which sailors easily lose their way. Along with the Skeleton Coast farther north, the area is notorious as the site of many shipwrecks. Some of these wrecked vessels can be found as much as 50 meters inland, as the desert is slowly creeping westward into the sea, reclaiming land over a period of many years. The border of the desert to the north and east is the foot of the Great Western Escarpment of Namibia, atop which more humid lands prevail. But in the south, a gradual transition merges the Namib with the Karoo and Kalahari deserts of the interior. A curious feature of the Namib Desert is circles on the ground that are accentuated by abrupt changes in the vegetation pattern. These circles, known as "fairy rings," are most noticeable from the air. There has been interest and speculation as to their origin for centuries. It is now thought that they are created by a termite. The dune sea of the Namib Desert. 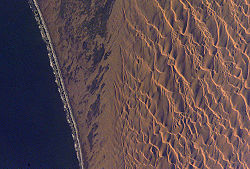 The crests of the dunes are aligned in a marked northwest-southeast orientation. These crests form crosswise to the formative wind. The dunes act as obstacles, and obstacles cause winds to be deflected significantly to the right in the Southern Hemisphere—in effect reorienting the southerly wind as a southwesterly wind. Climatically, the Namib is a contradictory area: It is almost rainless, yet its air is normally at or near the saturation point, and fog is very common. Temperatures in the coastal area are mild at all seasons, ranging between 58° and 67° F (14° to 20° C) in the warm season (December) and between 46° and 57° F (9° to 14° C) in the cool season (July). Inland, summer temperatures reach the 80s and even over 100° (30 to 45° C) during the day and drop into the low 40s (4 to 7° C) on the average winter night. On the coast, humidity is 100 percent for 19 hours per day in summer and for 11 hours in winter. At the inner edge of the desert, the air is much drier, fog is virtually unknown, and the humidity seldom exceeds 50 percent. This is nevertheless fairly high for a desert region. Violent weather is practically unknown; rare thunderstorms bring the precipitation, which averages less than 2 inches (51 mm) annually inland and about 0.5 inches (13 mm) at the coast. A major threat to the Namib Desert is the impact of off-road driving, which is greatest on the gravel plains where depressions left by vehicles remain for more than forty years because the rainfall is too episodic and sparse to erase them. These tracks are unsightly and cause long-lasting damage to the lichen fields. Lichens are particularly sensitive to mechanical damage as they grow extremely slowly and cannot quickly repair damaged thalli. Most of the damage is done by mining company vehicles on prospecting expeditions. The major threat to Namib-Naukluft National Park is the drop in the water table along the Kuiseb River, caused primarily by the extraction of groundwater, which supplies the domestic consumption of Walvis Bay and Swakopmund and the enormous demands made by a uranium mine near Swakopmund. At present, the Department of Water Affairs is trying to meet the requirements for water by prospecting for more underground water sources. If water were to be found, roads, pipelines, and power lines would have to be constructed through the most pristine dune desert in the world. The Kuiseb River and the vegetation within it act as a windbreak to the southerly winds, retarding the northward movement of the dune sea onto the gravel plains. The destruction of this natural barrier would have serious ecological consequences in this part of the Namib Desert. Another threat to the Namib-Naukluft Park is the pastoralists who graze large herds of goats and small groups of donkeys over the bed of the Kuiseb River and along the edge of the dunes. The livestock have overgrazed the understory plant growth and the fallen acacia seedpods in the riverbed and are competing for food with wild animals, such as gemsboks. ↑ Namib desert. World Wildlife Fund. Retrieved March 23, 2007. Bartlett, Des, and Jen Bartlett. “Africa’s Skeleton Coast.” National Geographic (January 1992): 54–85. Keen, Cecil. Greatest Places Physical Geography: Namib Science Museum of Minnesota, 1997. Retrieved March 18, 2007. This page was last modified on 6 November 2018, at 00:41.